Bainbridge GA Dentist | Dr. Jack H. Leverett, Jr.
Dr. Leverett Jr. has practiced dentistry in Bainbridge since 1996. He earned a Bachelor of Chemical Engineering from Georgia Institute of Technology and a Doctorate of Dental Medicine from the Medical College of Georgia. He has been President of the Southwest Georgia Dental Association and is a current member of the Academy of General Dentistry, the American Dental Association, the Georgia Dental Association and is a Fellow in the Pierre Fauchard Academy. Dr. Leverett is an active participant in coursework with the world-renowned Pankey Institute for Advanced Dental Education in Miami. 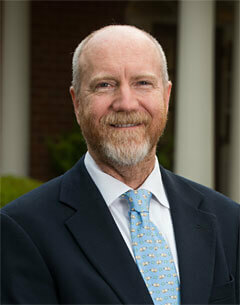 In 2006, Dr. Leverett was awarded Mastership in the Academy of General Dentistry (M.A.G.D.). The Mastership Award is the highest honor available in the AGD and one of the most respected designations in the profession. In pursuit of this accomplishment, Dr. Leverett completed 1,100 hours of continuing dental education in the 16 disciplines of dentistry, including 400 hours dedicated to hands-on skills and techniques. He successfully completed a written exam after the first 500 hours of continuing education to attain Fellowship status, and then over the next 5 years presented various cases of his own work in the different disciplines to a panel of dentists. Dr. Leverett was recognized as one of three civilian dentists in the nation to achieve certification by the American Board of General Dentistry for the year 2008. Certification by the American Board of General Dentistry demonstrates a dentist's ongoing commitment to excellence and willingness to be examined by his or her peers. Certification is awarded to those who successfully complete 1) a comprehensive written exam, 2) an oral exam covering all facets of general dentistry and 3) defend multidisciplinary case presentations against a panel of examiners representing the American Board of General Dentistry. Dr. Leverett's commitment to the profession of dentistry is evident through his relentless pursuit of patient education at the earliest possible stage of life in his practice and in his community. “To practice what is known” is his heartfelt personal mission statement; to continually apply new information in the prevention of dental disease embodies his passionate dedication to empowering others with life's most precious gift, good health.